At a hardware-focused event in New York City, Google introduced a new Pixel Slate tablet that features Intel 8th Gen Core processors. The Pixel Slate will ship later this year, with prices starting at $599. 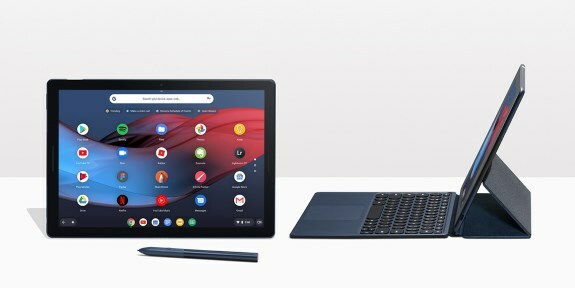 What's New: Today in New York City, Google announced the new Google Pixel Slate* featuring 8th Gen Intel® Core™ processors for amazing entertainment, connectivity and performance on the go in a beautiful, versatile, thin-and-light design. What It Offers: Engineering teams from Intel and Google co-engineered the Pixel Slate to deliver uncompromising performance, plus everything you love about Google for how you live and work today. Powered by 8th Gen Intel Core m3, i5 or i7 processor or Intel® Celeron® processors. 3-inch Molecular Display with 293 ppi for the sharpest picture. Get more done with powerful multitasking tools including split-screen and collaboration apps like Google Docs, Sheets and Slides. Pixel Slate automatically updates in the background, so you'll always have the latest features and security without any hassles. Pixel Imprint lets you quickly and securely unlock with the touch of a finger. Optional Pixel Slate Keyboard and Pixelbook Pen.